Scroll down the page for further information. Read our ﻿latest Year in Review ﻿or﻿ subscribe to our regular eNews updates. Or, find out how you can get involved. 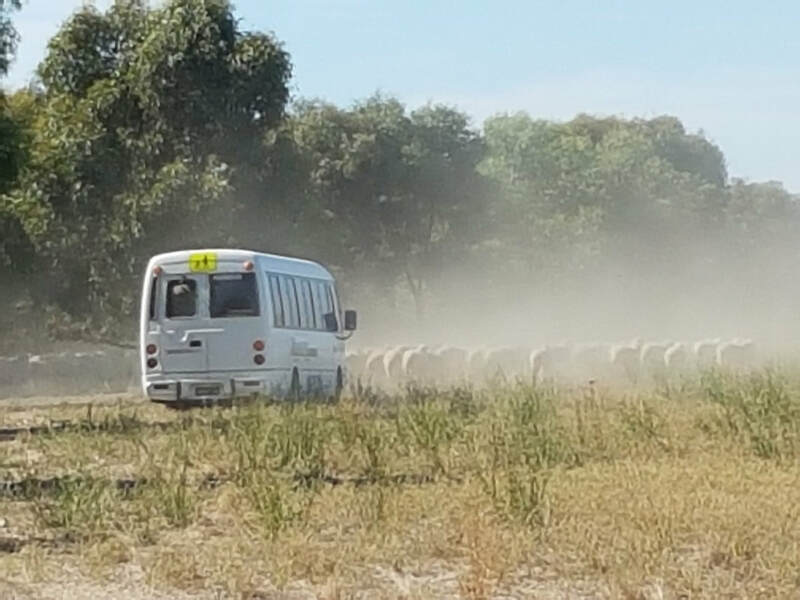 The Kara Kara CMN was fortunate to secure a Victorian Government Project Granto fund a series of seminars and field trips in 2017/18 aimed at educating the local community about native wildlife habitat and encouraging them to create wildlife habitat ‘where they live’. A mix of science and practical experience, the seminar programs discussed the structural elements that make up wildlife habitat, how habitat needs differ between various species and how these habitats can be recreated. The first seminar, 'Gardens for Wildlife', discussed recreating wildlife habitats in urban gardens, including a look at garden styles, what features can be added to both new and existing gardens to create habitat for a range of wildlife, and what Australian plant species are best for attracting wildlife to the home garden; from birds, small mammals and lizards to butterflies, native bees and other beneficial insects. Taking a slightly different tack, the second seminar entitled 'Farms for Wildlife' focussed on creating and improving wildlife habitats on lifestyle blocks and in farm settings. Revegetation works and scattered farm trees help to create corridors to facilitate species movement through the landscape, while structural features such as nest-boxes, hollow logs and rocks provide shelter, food and places to breed. And wildlife aren’t the only winners. Improving farm biodiversity brings benefits for humans too, both economically, and for personal wellbeing and mental health! As valuable as learning about the science and hearing people’s practical experiences can be, there’s nothing quite like seeing habitat creation projects for oneself. That’s why the seminar series also included two field trips, the first to a sustainable farming property near Serpentine, and the second touring the Australian Garden at the Royal Botanic Gardens in Cranbourne including a special ‘behind the scenes’ look at how the RBGC works to protect and monitor a local population of Southern Brown Bandicoot. So ended a worthwhile and informative series. If you missed out on the seminars or would like a recap of the information presented, check out the speakers’ presentations and links on our ‘Events and Resources’ page. 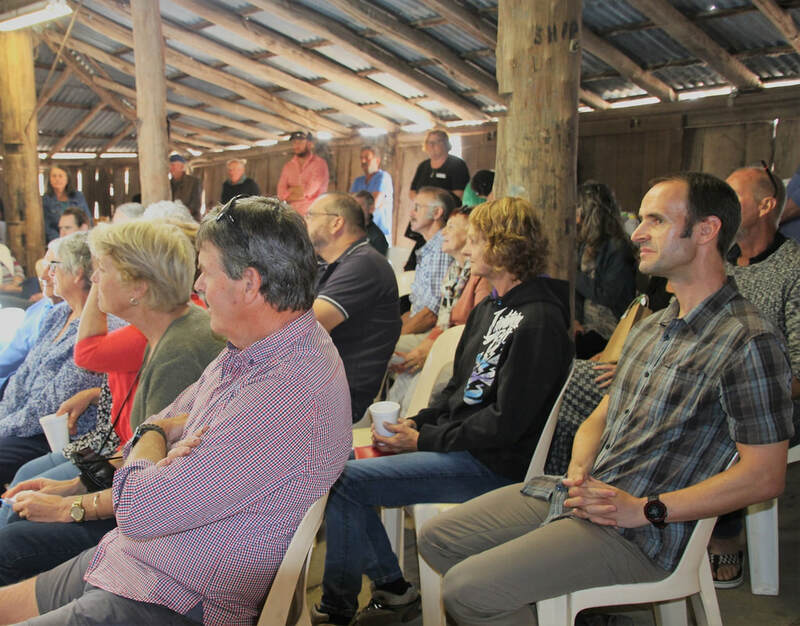 Pictured at right (from top): 1) Attendees at the 'Farms for Wildlife' seminar at historic Tottington woolshed; 2) Royal Botanic Gardens ecologist, Dr Terry Coates, points to evidence of nocturnal foraging by Southern Brown Bandicoots in the native bushland adjacent to the Australian Garden at Cranbourne; 3) 'Gardens for Wildlife' seminar attendees collect their free Australian native plant to start them on their habitat creation journey; and 4) Inspecting shelter belts during a tour of a private property near Serpentine, Victoria. Silver Banksia (Banksia marginata) was once common across south-eastern Australia but over time widespread land clearing has seen its range decline to the point that it now occurs only in small isolated patches or as single aging trees. Many of these smaller Banksia populations are at risk of becoming inbred, leading to a loss of vigour and poor germination rates while reducing a population’s ability to recover from environmental ‘shocks’ such as disease and climate change. The Silver Banksia Project is a collaborative program that aims to ensure the survival of this species over the long term using the combined efforts and co-operation of several conservation groups around Victoria. 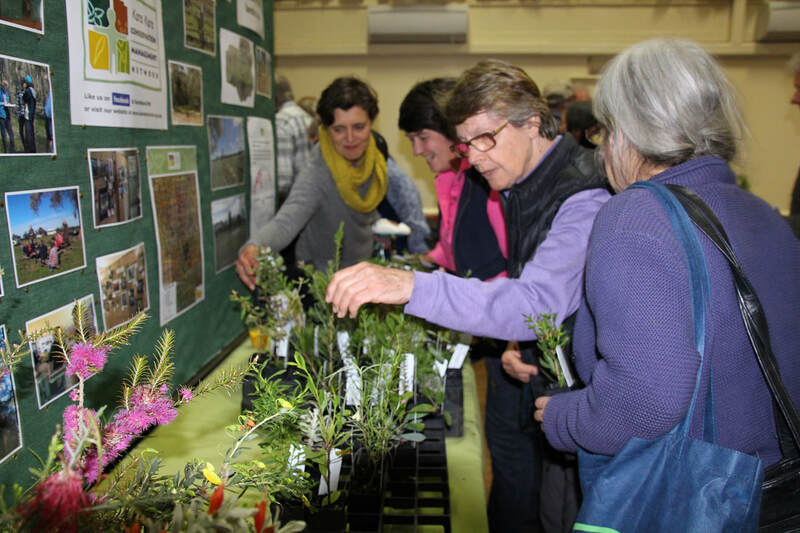 To start the process locally, in 2017 the Kara Kara CMN put out a call to the community in and around St Arnaud to help locate remnant patches of Silver Banksia. Leaf samples taken from these local populations and others in central Victoria were then sent to Deakin University for a ‘DNA health check’. Results of this genetic testing are outlined opposite. 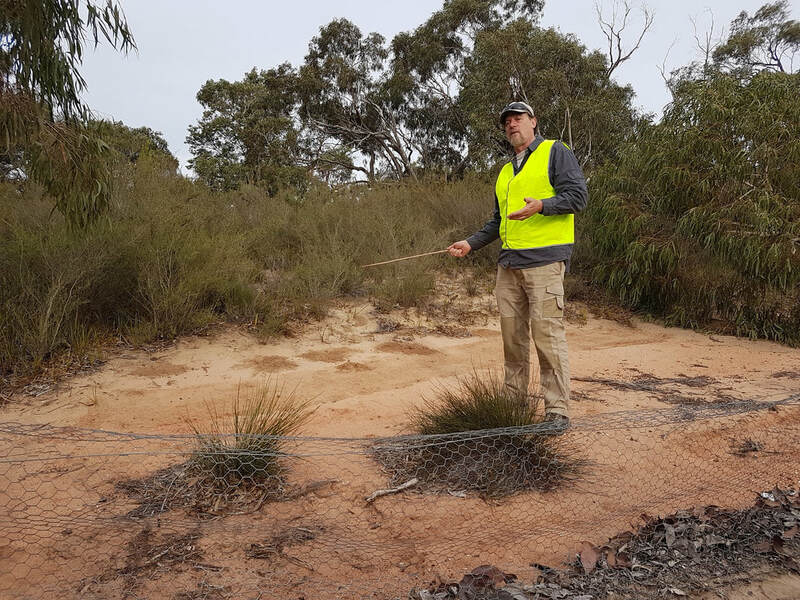 In another initiative to help save this iconic species, the Kara Kara CMN established a Silver Banksia 'orchard' on private property at Carapooee, a project echoed by other groups across south-west, central and north-western Victoria. Some of the seedlings these orchards produce will be reintroduced into local Banksia patches to improve gene flow and improve genetic diversity, while others will be used in future revegetation projects on both public and private land. In the meantime, if you think you might have Silver Banksia growing on your property and would like to help, get in touch. Silver Banksia genetic testing results are in! Restoration efforts should focus on bolstering the genetic variability of local populations; in other words, by introducing plants from other regional populations to facilitate cross-pollination and gene flow. In a nutshell, if we are to save the Silver Banksia, we need to act now! To read Adam's full report, see our Events & Resources page. 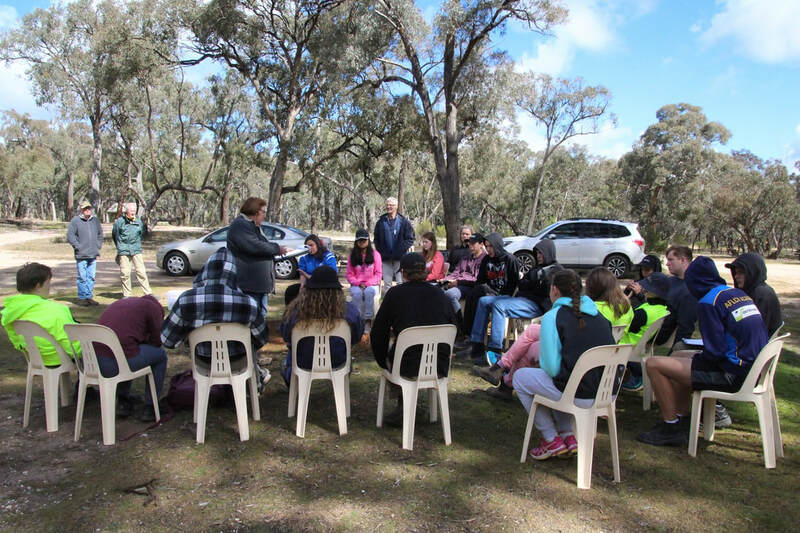 Spring 2018 saw the Kara Kara CMN play host to Donald High School Year 9 students for two days of outdoor environment and conservation-related activities during the School’s ‘Green Week’. Held in the Kara Kara National Park and nearby Stuart Mill and Dalyenong Nature Conservation Reserves, the activities were associated with a series of education modules developed by the Network to help students of all ages better understand the natural environment and how it’s organised. Growing up in rural Australia, it can be easy to take our native woodlands for granted; to see them as just patches of vegetation and ‘scrub’, when in reality, they are complex ecosystems full of intricate and fascinating species interactions. The education modules were developed to help students learn about these interactions first-hand and in a fun way, outside of the usual classroom setting. Over the two days, students worked in teams and competed for points as they identified the biological, physical and chemical features within the landscape, explored food webs, examined species’ relationships and undertook habitat assessment exercises using some basic scientific monitoring techniques. A particular highlight was assisting visiting native orchid ecologist, Julie Radford, undertake a survey of native heathland to seek out some of the region’s rare and endangered spider orchids. Judging from student feedback, the program was a great success. Special thanks to all of the Year 9 students and teachers who took part and we look forward to welcoming a new group of students in 2019. If you’ve ever been shopping for a new home, you probably had a wish-list of features in mind. Many of Australia’s native birds and mammals use tree hollows for shelter and breeding and, like us, they have particular preferences when seeking out a new home. Size, shape and aspect are all important hollow attributes, as is safety from predators and, for some species, even the type of eucalypt. 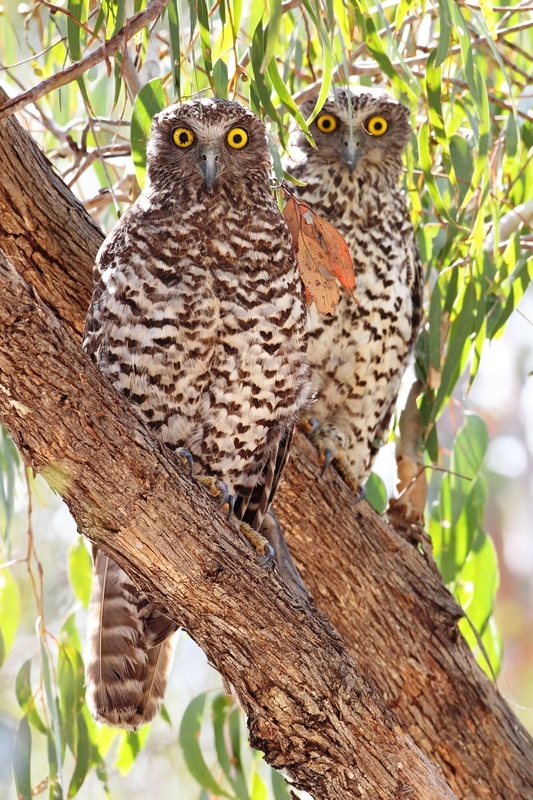 Birds such as parrots, kingfishers, owls, nightjars, pardalotes and ducks all use hollows, as do many species of arboreal mammal including possums, gliders, antechinus, phascogales and various species of microbat. Australian eucalypts have evolved to form hollows, dropping their branches which are then hollowed out over time by fungi, termites and other natural processes. However, hollows can take many decades to develop, sometimes up to 120+ years. With the number of mature hollow-bearing eucalypts in our native forests becoming severely depleted due to land clearing, timber harvesting and other causes, the installation of species-specific nest boxes can alleviate this hollow shortage and help to secure the future for our native wildlife. Nest boxes can also be useful tool for surveying the wildlife that inhabits a particular area, or in observing how birds and animals behave. If you’d like to install some nest boxes at your place and you live in the St Arnaud area, contact the Kara Kara CMN. We can help with sourcing sturdy nest boxes designed to suit a range of wildlife, or if you prefer to build your own, we can advise on appropriate box design and placement. Pictured: Native arboreal mammals such as the Sugar Glider (above) and Yellow-footed Antechinus (below) rely on tree hollows for shelter. Each year, the Kara Kara CMN enlists the help of students from the regional secondary colleges to construct nest boxes to benefit the region’s native wildlife. Involving woodworking students from St Arnaud, Charlton and Donald Secondary Colleges, the boxes are being used to help address the shortage of tree hollows for the region’s tree-dwelling mammals, and in particular, the threatened Brush-tailed Phascogale which is known to occur in the woodlands around St Arnaud. Phascogales aren’t the only species that will benefit from the project. Antechinus as well as several glider and possum species also depend on tree hollows for breeding, shelter and protection from predators. It is hoped that the nest box project will help to relieve tree-hollow competition for these species as well. 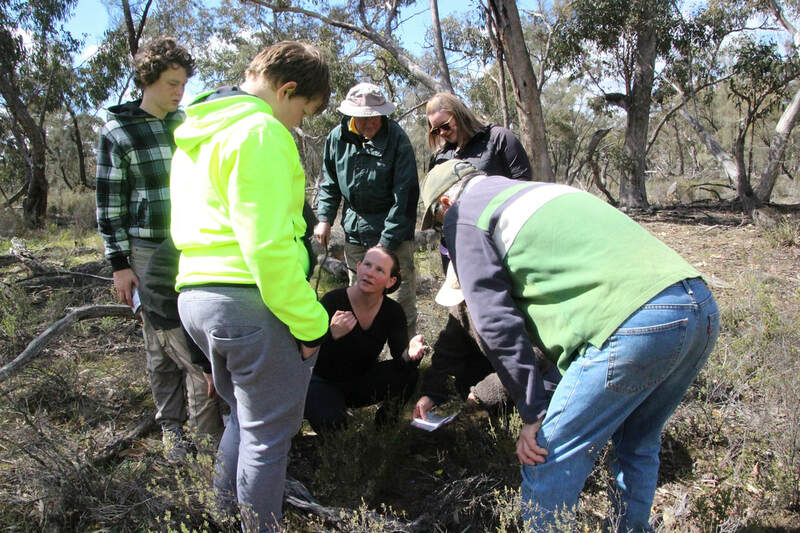 The Network installs the student-constructed nest boxes in remnant native woodland on private properties around St Arnaud. An ongoing program to monitor nest box activity is also about to commence. 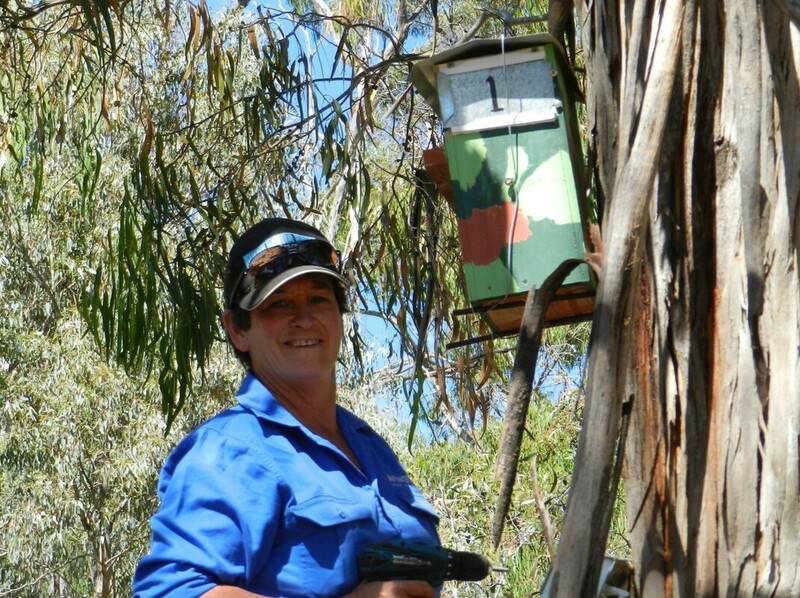 Bottom - Network volunteer, Brenda Proctor, installs the first of many nest-boxes in the St Arnaud region. The findings of our woodland bird project are in and the news isn’t good, with at least 30 species found to be at moderate to high risk of local extinction. These results represent the findings of a study undertaken in 2014 which analysed data from two sources: firstly, from survey data made available by the St Arnaud Field Naturalists Club Inc. covering the 12-year period from 2002 to 2013; and secondly, from field surveys conducted during 2014 to collect baseline data on contemporary woodland bird assemblages in the Kara Kara CMN territory. Thirty-four woodland species were selected for analysis, including species identified in other studies as being in decline in southern Australia; species of conservation concern; and species identified by the researchers as occurring at low levels in the field. To summarise the study results, 26 (76%) of the selected species were either absent (4 spp. ), present as isolated records only (4 spp. ), in decline (8 spp. ), or their occurrence rates remained steady but at low levels (10 spp.). The remaining eight species (23%) increased in occurrence, although rates for all but two species were low. When occurrence rates were averaged to determine occupancy status, 88% of species were either absent (4 spp.) or had low occupancy (26 spp), and the remaining 12% (4 spp.) had moderate occupancy, although in decline. To read more, read the woodland birds presentation on our ﻿Events & Resources﻿ page. Woodland birds are one of the Kara Kara CMN’s key conservation targets and these results will help us in prioritising habitat rehabilitation and restoration efforts going forward. They will also form the basis for ongoing monitoring of woodland bird assemblages in our region over time. A native of south-east Asia, the Common Myna (Sturnus tristis) – sometimes called the Indian Myna(h) – has steadily gained a foothold in south-eastern Australia since its introduction in the mid-19th century. 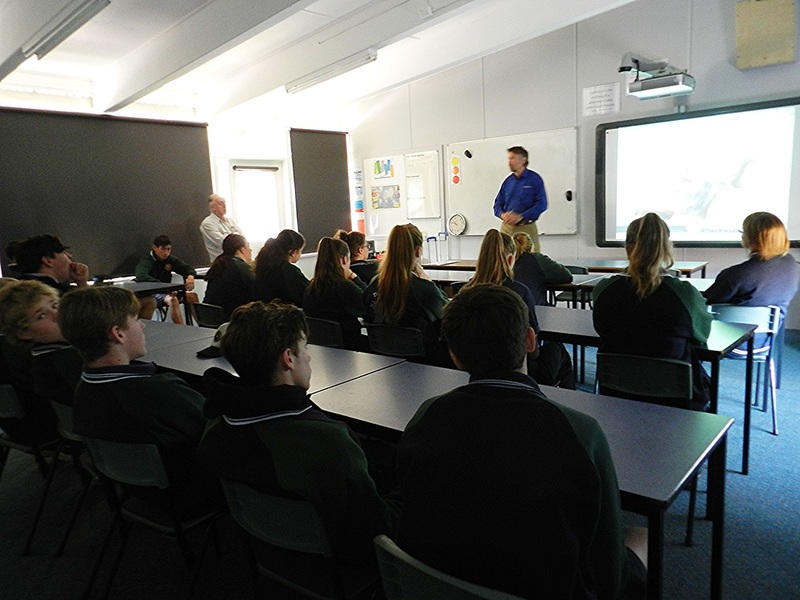 Following a marked increase in the number of Myna sightings in and around St Arnaud, the Kara Kara CMN launched its Common Myna Project, aimed at raising awareness and educating the community about Myna ecology and control. This aggressive and invasive bird pest contributes to the decline of threatened native birds by out-competing them for food along forest edges and in urban areas, and by occupying tree hollows that would otherwise be used by native birds as nesting sites during the breeding season. The Kara Kara CMN is encouraging the local residents and the wider community to help stop the spread of Common Mynas, mostly by limiting the availability of their food sources. Simple things like feeding pets indoors, cleaning up grain spills, avoiding putting out seed for native birds, and covering chicken pens with wire netting to exclude Mynas from gaining access to food scraps can help stop the spread of this invasive pest. To find out more about Common Mynas and what you can do to help stop their spread, read our Fact Sheet. The Kara Kara CMN also has a specially-built Myna trap which is available for loan to the community on payment of a refundable deposit. The trap also comes with a Fact sheet of usage guidelines covering trap use as well as information on the humane disposal of captured birds.